Immunogenicity testing of therapeutic proteins is an essential step of the drug development process. Anti-Drug antibodies (ADA) may lead to allergic reactions, altered pharmacokinetic and reduced efficacy. the most frequently used endpoint to study unwanted immunogenicity in clinical studies and post marketing clinical monitoring. Screening assays detects all antibodies binding to the biopharmaceutical in serum samples of animals or patients. 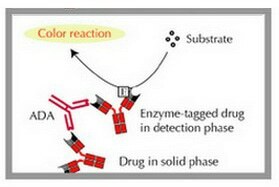 Positive evaluated samples can be further characterized for the presence of neutralizing antibodies (NAB) against the drug. Assay formats are cell based techniques with carefully selected biological readouts that correspond to the mode of action of the drug (potency). Creative Diagnostics offers its bioconjugation and assay development expertise free of charge to any user. Creative Diagnostics can also develop immunogenicity methods in ELISA or rapid assay format for clients who prefer to do so.